The Phelps family is troubled and anxious after receiving the anonymous letter Tom wrote. Tom and Huck are sent to bed early, where they get ready to take a lunch they have prepared, along with a dress, to Jim. Tom notices there’s no butter with the lunch, so he sends Huck to get some. As he’s returning with the butter, though, Aunt Sally discovers Huck. She questions him and sends him to the sitting room for further questioning. Even though Tom has gotten his way in planning Jim’s escape, he is tyrannical about even the smallest detail, like the butter, which he forces Huck to get despite Huck’s protests. It is Tom’s silly need to do everything prescribed by his books that best characterizes his immaturity. In the sitting room, Huck is surprised to see fifteen farmers, all with guns. Huck wishes Aunt Sally would get through with him so he can tell Tom about the farmers and commence rescuing Jim before it’s too late. Aunt Sally questions Huck, but he’s so nervous because the farmers are talking about heading out then and there to lie in wait for the gang that he becomes feverish. The farmers rush over to make sure Huck is alright, snatching off his hat as they do, out from under which comes the bread and butter he took. Aunt Sally is grateful Huck is okay and sends him to bed. Many of the Phelps’ neighbors come to the family’s aid in securing Jim (which is absurd given that Jim is a human being and not a piece of property to be guarded in the first place). This is a society, it would seem, that deeply honors the idea of private property; its members are willing to die to protect another member’s property. The irony, of course, is that Jim belongs to himself and no one else, yet he is denied that right of self-possession. Huck hurries to meet Tom inside Jim’s hut to tell him about the farmers. Tom is elated, but assures Huck that Jim is disguised as a woman and ready to make a run for it. Just then, the farmers come outside to the hut and open the door. Tom, Huck, and Jim escape through a hole they had made, and soon begin to make a run for the fence. However, Tom’s pants catch a splinter. When he frees himself, a ripping noise alerts the gun-toting farmers who, after asking whoever’s there to identify themselves without response, begin to rush over, shooting as they do. Tom must be very much out of touch with reality to delight in the fact that there are many armed, dangerous men keeping an eye out for people escaping with Jim, given, of course, that he is just such a person. The armed farmers prove to be indiscriminately violent, shooting in the dark at they don’t know what. They mindlessly run the risk of shooting Jim, which would defeat their purpose entirely. Chased by both men and dogs, the three run toward the river and at last arrive at their raft. Everybody’s glad to be safe and free, especially Tom, because he had the honor of being shot in the calf of his leg. He is in considerable pain and bleeding. After some deliberation, Jim says he will not leave Tom’s side. Huck knew that Jim would say that, because he knows that Jim “was white inside,” and, while Jim tends to Tom, Huck goes off to fetch a doctor. Tom idiotically revels in his wound, which he thinks is fun and exciting. It was his plan that endangered his friends and got him shot, and it’s because he got shot that Jim feels duty-bound to risk his own freedom by staying with Tom. Huck’s comment that Jim is white inside at once acknowledges Jim’s equality, but also insidiously suggests that people who are “black inside,” so to speak, are bad. Huck is able to see past society's rules to see Jim's basic humanity, but he still accepts his society's larger social laws that to be human means to be white. This dichotomy strikes the reader as ridiculous—the reader can generalize from the fact of Jim's basic humanity to all slave's basic humanity. Twain uses Huck's inability to do the same to actually underscore the point, and further condemn Southern society for its cruel, ridiculous blindness. Wilson, Joshua. 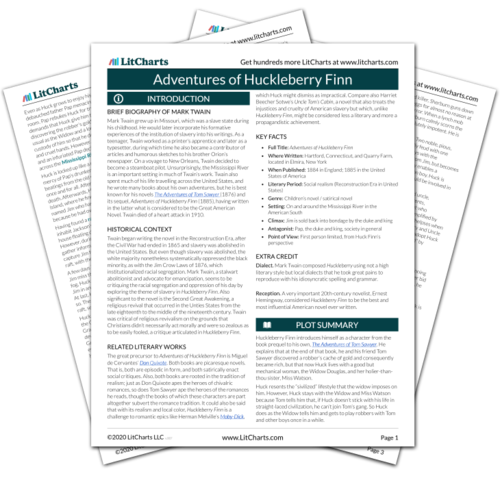 "The Adventures of Huckleberry Finn Chapter 40." LitCharts. LitCharts LLC, 19 Sep 2013. Web. 9 Apr 2019. Wilson, Joshua. "The Adventures of Huckleberry Finn Chapter 40." LitCharts LLC, September 19, 2013. 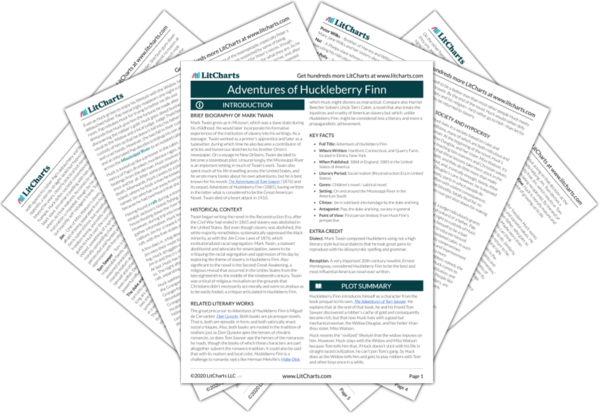 Retrieved April 9, 2019. https://www.litcharts.com/lit/the-adventures-of-huckleberry-finn/chapter-40.